Want to explore the muddiest and messiest of the marshlands, without getting stuck chest-deep in the mud screaming "Artax! No!"? This is the 21st century, so naturally there is an insane machine that will get the job done with obscene power and style. Let the Shaman take you on a vision quest. Designed and constructed by Russian custom builders Avtoros, the Shaman is a total beast. 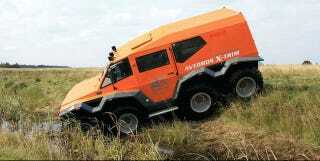 It measures 6 meters in length, standing 3 meters tall and 2.5 meters wide with a 450 millimeter ground clearance. The vehicle is powered by a 146 HP 3.0-liter turbo diesel with a 6 speed manual which delivers a top speed of 80 kph. The 130 HP gas engine as well as a pair of larger 178 and 240 HP diesel engines are optional. And while that's a bit pokey to take on your local freeway but this vehicle is clearly not built for the stuffy confines of civilization—or even roads for that matter—you only need to look at its steering system. For one thing, the driver doesn't not steer the vehicle from either the left or right hand as most passenger cars do. Instead, he sits dead center of the console in a huge "captain's chair" that provides a commanding view of the surroundings. What's more, the Shaman has three drive settings: one for On-Road (front 4WD), one for Off-Road (active rear-wheel steering for tighter turns and better control), and "Crab Mode" which activates the 8-wheel drive, allowing you to scuttle over just about anything—including traversing a 45 degree angle while hauling 1.5 tons of cargo and seven other passengers. Most amazingly, even with a dry weight of 2.5 tons, the Shaman is actually buoyant and can travel through water at speeds up to 7 kph or simply float down river. If you were looking for a vehicle for the end of the world, this has got to be your first choice.